Ross Martin is best remembered for the role of Artemus Gordon on the Wild Wild West TV series. 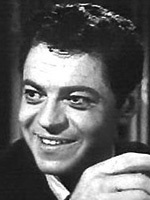 Ross Martin (born Martin Rosenblatt, March 22, 1920 – July 3, 1981) was a Polish-born American radio, voice, stage, film and television actor. Martin was known for portraying Artemus Gordon on the CBS' Western series The Wild Wild West, which aired from 1965 to 1969. He was partners in a comedy team with Bernie West for several years, then appeared on many radio and live TV broadcasts before making his Broadway debut in Hazel Flagg in 1953. Martin's first film was the George Pal 1955 production Conquest of Space, followed by a brief but memorable appearance in The Colossus of New York (1958), as the scientist father of Charles Herbert. In 1959, Martin appeared in the episode "Echo" on Alcoa Presents: One Step Beyond. He appeared in two 1959 episodes of David Janssen's crime drama series, Richard Diamond, Private Detective. Soon after, he caught the eye of Blake Edwards who cast him in a number of widely varied roles; as Sal in the 1959 Peter Gunn episode "The Fuse", his breakout role as the comic sidekick Andamo in the 1959 CBS drama series Mr. Lucky, the asthmatic kidnapper Red Lynch in the 1962 thriller Experiment in Terror, culminating with a role in The Great Race, as the smoothly villainous Baron Rolfe Von Stuppe. He was also a regular on Stump the Stars from 1962-1963. He was the voice of Doctor Paul Williams in 1972's Sealab 2020, additional characters in 1973's Butch Cassidy and the Sundance Kids, and additional character voices in 1978's Jana of the Jungle. After The Wild, Wild West ended, Martin continued his career in various guest roles on television and in roles in television films. In 1970, Martin portrayed Alexander Hamilton in the NBC television special Swing Out, Sweet Land, hosted by John Wayne. He also appeared in a 1970 episode of The Immortal ("White Elephants Don't Grow on Trees"). The following year, Martin tried his hand at directing. He guests starred in the 1971 episode of Columbo entitled "Suitable For Framing", as a murderous art critic and also a 1971 episode of Love, American Style, which he also directed. Martin directed another episode of the series in 1973. Later that same year, he appeared as the famed Asian detective Charlie Chan in The Return of Charlie Chan. He made a guest appearance on Barnaby Jones in 1974, and also lent his voice to an episode of Wait Till Your Father Gets Home later that year.